Come here to find news on how to overcome physical challenges and keep the people you care for living safely and comfortably in their homes. Whether you’re an occupational therapist, professional caregiver or simply caring for someone you love, you’ll discover tips you need to help people live life to the fullest. At home. When a senior slips on the bathroom floor, consequences can be tragic. As we age, our bodies become more frail and a fall can set in motion an unwelcome chain of events: broken bones, a trip to the emergency room, a move to an assisted living center, or even death. According to the U.S. Center for Disease Control and Prevention, falls are the leading cause of fatal injury and the most common cause of nonfatal, trauma-related hospital admissions among older adults. Since a fall often is triggered when a senior’s feet take on a life of their own on a slippery floor, I’ve compiled a list of bathroom flooring options that provide more grip. And because of the wet environment, all recommendations are, of course, water resistant. Many vinyl floors are slip resistant and not only provide traction, but also provide softer landings than a ceramic tile floor should a fall occur. Also, they are available in hundreds of patterns and colors to give your bathroom a fresh, upscale look. Vinyl is easy to install and maintain, cushions your steps, and is reasonably priced. It’s available in both sheets and tiles. And while tiles are easier to install, you’re better off using sheet vinyl for seniors since the tiles can curl up and become trip hazards. If you want a floor with traction that‘s kind to the environment, cork is an excellent choice. It’s renewable, comfortable underfoot, and resists dimpling. Got allergies? Cork is anti-allergenic and anti-microbial. Ceramic tile flooring provides the ultimate in durability. It’s resistant to scratches, bacteria free, and easy to clean and maintain. And this hard working floor is available in a stunning array of designs, colors and finishes from rustic to contemporary. Not all tiles are slip resistant. Make sure that you install ceramic tiles that meet the ADA requirements for slip resistance. Some ceramic tiles have an anti-slip treatment that provides the grip seniors need. Also, unglazed tiles offer better slip resistance than glazed tiles. If you want to make a good thing better, add grout. Grout placed between tiles adds to its traction. 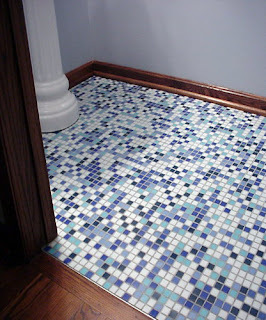 So the smaller the tiles, the more grout, and the more slip-resistant the floor. Tiles are usually available in 2” x 2”, 4”x 4,” and you can even find less than 1” square mosaic tiles in pre-mounted mesh sheets. A myriad of tiles for a lot of traction! Rubber flooring is available in interlocking squares or rolls. The squares fit together seamlessly so there’s no fear of tripping on a rough surface. If a senior suffering from Parkinson’s disease and tends to shuffle along rather than picking up his feet, a rubber floor might be a good option. Also, for more security in case of a fall, you can add to its natural by putting more padding underneath it. Don’t worry--it looks better than you’d think! P.S. If you live in New Jersey, Pennsylvania or Delaware, please contact us for a free in-home consultation—we’ll let you know if your loved one is safe and what we recommend. Or call us now at 1-877-426-8466. What experiences have you had with flooring for seniors? How do you plan to prevent falls in the bathroom for the seniors you care for? These are all great options for flooring when it comes to older generations. Also try adding non-slip vinyl pads to especially slippery areas, for safety! What’s the Cost of Not Remodeling a Senior’s Bathroom?